yesterday, while walking with a friend to school to pick up little boy, I realized that I am too, too stressed, and no matter how much I work or how hard I work, I will not get back the 30+ working hours I lost while he was sick. It is not reasonable to expect to be able to do 6 kiln firings in 14 days, and ware that is wet now will not be dry enough to fire by Friday. With a heavy heart, I called the gallery and told them that I would not be able to have my show on April 26. While I was at it, I shed a few more things that I considered responsibilities, because when you don't feel like you have enough time to mow the lawn (or make a sign proclaiming it honeybee preservation plot to explain why the spring weeds are shin-high), you've got too much on your plate. We went to the doctor's office yesterday- little boy got the "all clear" from his pediatrician, the ear infection that's plagued him since the first of March is finally, finally gone, just in time for spring allergy season. We're fighting with honey and royal jelly, this year. I will be blogging less frequently until I feel slightly less insane, but I should have new glazed work to show in the next few weeks. 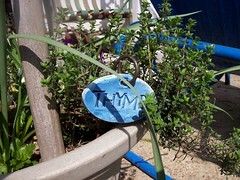 Since I'm not doing the show, some work, like these herb markers, will be available on etsy. If you're a regular reader and you want some, especially if you want an herb that's less common (I'm thinking oregano, basil, parsley, etc as the common ones), please let me know. They'll be $6 each, including shipping. There will be a volume discount for 4 or more. I'm going to tend to my garden and lawn now while I regain my equilibrium. Oh, and HELLO! to everyone who pops over from One Black Bird. Thank you, Diana. You are so gracious. I am honored and humbled to be included on your list.